Contrary to appearance, the man-eating cooks of the Depths are actually female, as told by Laurentius.(Unconfirmed. Though this is supported by the encounter with Maneater Mildred, Laurentius simply says "she". Since there are two butchers, who both appear to eat their meat cut and prepared, it is safer to assume he was talking about the giant rat the butchers seem to feed.) They are busy preparing lunch for the inhabitants, and you arrived just in time to get on the menu. Depths. There are two butchers, one is behind the butchers table, the other is hiding on a platform above the entrance to the room where Laurentius is trapped. Burly butcher with a Sack on her head, wields a big meat cleaver and a bloody wooden stake. One-two Cleaver swings: Her basic attack is a typical swing with her cleaver, it has medium range and can do quite the damage against light armored classes. Running swing: She holds her cleaver upright with one hand while running, then swings at you. Knockback when blocked, can knock you down if unblocked. One-hand chop: She holds her cleaver upright with one hand while crouching, then lunges forward and smashes it to the ground. Can track player position. Will knock you back if blocked, or knock you down if unblocked. Two-hand chop: She holds her cleaver with both hands and smash it to the ground. Slow and easy to dodge. Knockback when blocked, can knock you down if unblocked. Stake combo: She will do a relatively quick unblockable attack with her off-hand stake. If you are caught you'll be pinned to the ground, and she will follow up with an unblockable cleaver chop while you are lying face down. The first butcher can be defeated relatively easily with arrows or one of the Soul Arrow spells you can purchase from Griggs of Vinheim. To do this, sneak down the stairs and aggro the dog so that you don't have to deal with him. Back up the stairs and kill the dog in the "dining room" area. Then, shoot the butcher from the balcony here and slide to your left once she starts coming for you. She will fall into the water below. Go down the stairs and shoot her while she's in the water. You will always hit if you time a bow shot when she reaches the top of the stairs. Slide left, up the stairs, to lure her off-course and back into the water. Repeat until she's dead. You can drop on her for a drop-attack to finish her off if you're running low on spells or arrows, especially with the Giant Rat coming up before the next shrine. Fighting the butchers is pretty straight forward. The problem is that several of their attacks can knock you to the ground, and they are also able to hit you while you are knocked down. Use the pillars to your advantage, or clear out the 'cafeteria' upstairs and fight there if you need more space to maneuver. Try to stay behind them and avoid their heavy attacks. The slow two-handed attack gives you plenty of time to get behind and backstab. The left handed stake-combo takes a good chunk of health if it connects, so take caution. Circle counter clockwise to avoid the stake up close, going clockwise can get you caught. 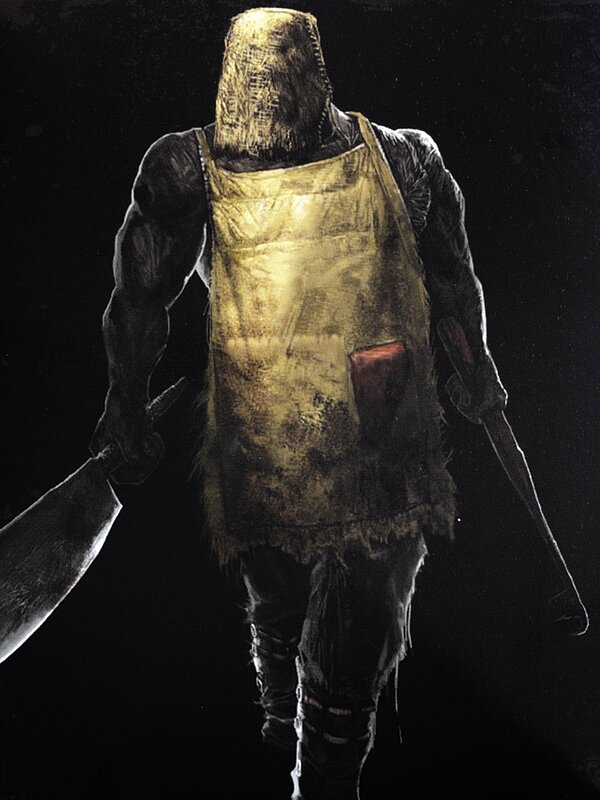 The butcher knife they are wielding is dropped by Maneater Mildred, who also wears a sack on her head. She is believed to be another cook who's searching for more sources of meat.